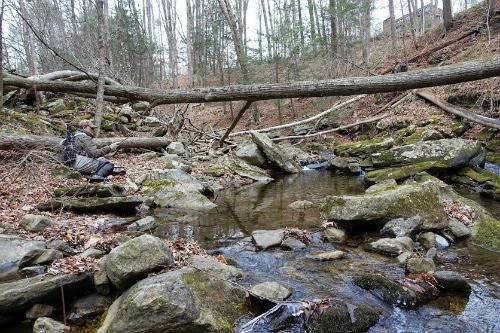 As much as I have written lately about long rods and big rivers, I am still drawn to small streams, the thin blue lines on the map that almost call you to come explore them with a light rod, a light lunch and a small box of flies. 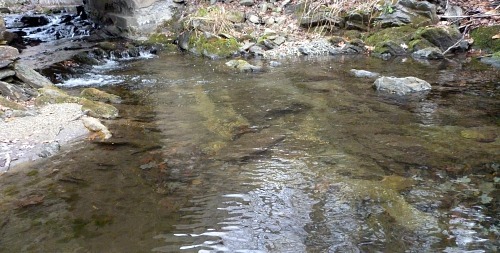 The thin blue lines on the map here in the East often hold wild trout, either browns or brookies, depending on the stream. Some hold both. The one I went to on Sunday I'd thought might hold brookies. 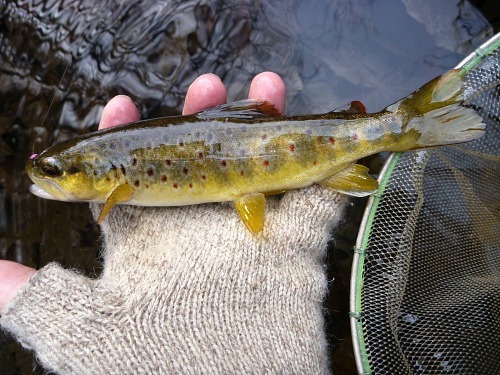 The fellow tenkara angler I was with had one on his line briefly, but the only fish we had in our nets were browns. 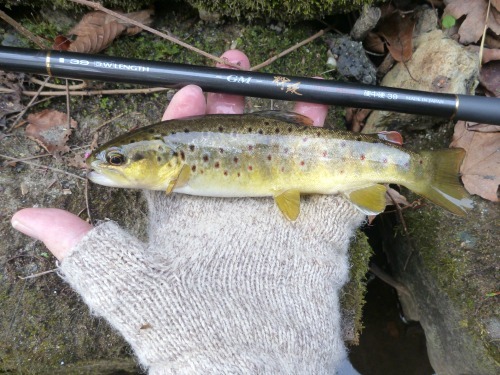 This trip was my first tenkara trip after the start of the TenkaraBum Winter Challenge, in which anglers get points for fish size and hook size. The fish above, an 8 incher caught on a size 20 hook, scored 28 points (8" + #20). I am confident that there are tenkara anglers out there that will absolutely trounce me. Let's see your fish! The 4" fish shown above scored 4 points. The huge difference in the scores for the two fish is because there are three categories in the challenge: Largest, Smallest and Combined, and fish are scored differently in the Largest and Smallest categories. In the Largest category, the hook size is added to fish size (in inches). For the first fish shown above, the 8" length is added to the #20 hook to yield a score of 28. Using smaller hooks can dramatically raise the score. The highest score wins. 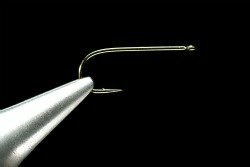 In the Smallest category, hook size is not part of the scoring (although all entries must be caught with hooks size 20 or smaller). The score is just the fish's length in inches. The lowest score wins. 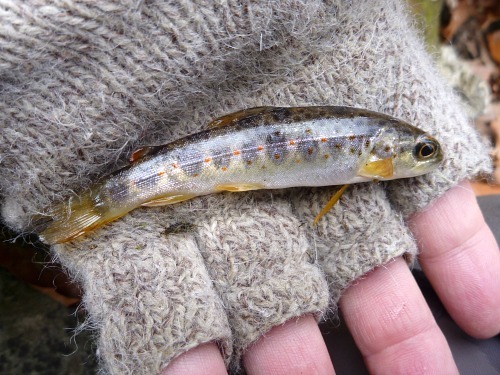 After an angler submits two fish, the larger of the two is entered in the Largest category and the smaller in the Smallest category. The angler can submit a later catch if it would score higher in the Largest category or lower in the Smallest category. 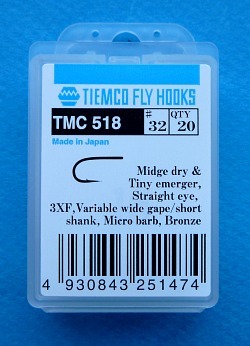 Now that I'm at least on the board, I'm going to start fishing smaller hooks to try to score higher in the Largest category, and also hopefully catch smaller fish for the Smallest category. The Combined category takes the angler's score in the Largest category (28 if using the top fish above) and subtracts the Smallest category score (4 in this case).The Combined score for the above two fish is 24. Highest Combined score wins the overall competition. To win the Combined category, and the overall Challenge, an angler will have to catch a large fish on a small fly, and will also have to catch a very small fish. My score of 24 is not going to be even close to a winning score. I would guess top scores will be in the forties. Or rather, I'll be disappointed if they aren't. 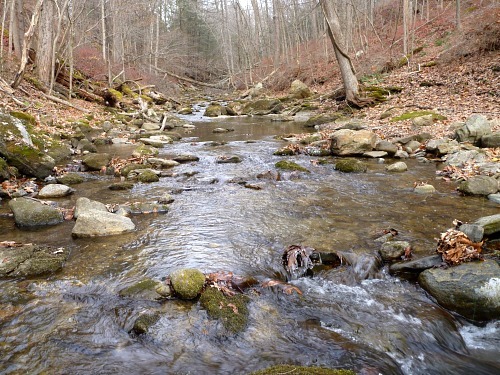 Back to the trip report - when we got to the stream, the water was low and clear. That makes for tricky fishing anywhere, but with smaller streams in the East, where streamside brush and overhanging branches limit your rod length, it truly puts a premium on stealth. I don't think I've ever spent as much time fishing on my knees, or actually fishing sitting down. 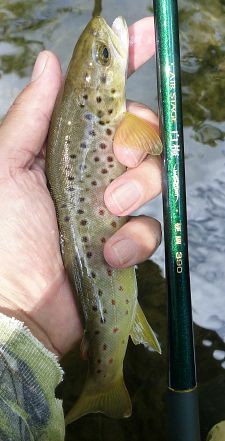 The guy I fished with spent most of the day with either a Soyokaze 24SR or a Nissin Air Stage 240, which is just a wonderful rod for really tiny streams - the thinnest of the thin blue lines. I fished with a Suntech Suikei 39 medium (almost entirely at the shortest 3.2m length). A lot of my casts were low, just a few feet over the water, rod almost horizontal to keep the line under overhanging branches. It's not that hard to do when you are kneeling or sitting down on the streambank! I had shorter rods with me that I could have used, but it's been a while since I last fished with the Suikei medium - and besides, it's coming back! That's one of the benefits of dealing with a smaller company like Suntech compared to a corporate giant like Daiwa or Shimano. Suntech had discontinued the rod a couple years ago but I was able to persuade them to do another production run! I'm not sure when I'll get them but I have to say I'm pretty excited about it. It's like a softer Field Master - just as versatile but measuring 18.5 - 20.5 pennies compared to 24-28 for the Field Master. The day wasn't a "many" day. I caught 5, missed one and had one more on briefly. They were all in the 4-8" range, all caught on CDC&Elk or black Killer Buggers. I got to fish with a guy I'd known for a while but had never fished with, and fished a stream I'd known of for a while but had never fished. I'm sure he and I will fish together again. 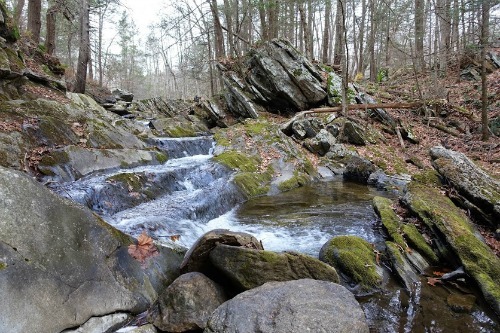 We may go back to the same stream, but maybe not. There are just so many thin blue lines that are calling us to come explore.